BOZEMAN — In the fight against an invasive fish that has decimated Yellowstone National Park's iconic cutthroat trout, a technology developed at Montana State University could help park managers more effectively locate fish for removal. During recent flights over Yellowstone Lake in a small aircraft, MSU's device was able to identify clusters of two or more lake trout to a depth of at least 26 feet, according to Joe Shaw, professor of electrical engineering in MSU's Norm Asbjornson College of Engineering and co-author of a May 20 article describing the findings in the journal Applied Optics. The lidar technology — so called because it operates similarly to radar by measuring reflections of harmless, non-visible pulses of laser light — could be used to more easily determine areas to target with gill netting, the main method that park managers use to capture non-native lake trout in an attempt to reverse the decline of native Yellowstone cutthroat trout, according to co-author and Yellowstone fisheries biologist Patricia Bigelow. "It has the potential to be a great tool," Bigelow said. Lake trout, thought to have been introduced illegally into Yellowstone Lake in the 1980s, are efficient predators that eat a significant number of cutthroat trout, whose native range in Montana, Idaho and Wyoming has shrunk considerably in recent decades. Since lake trout were first observed in 1994 in the park's largest water body — considered a stronghold of the remaining cutthroat trout population — the number of spawning cutthroat trout has declined nearly 99 percent in some areas. The National Park Service spends $2 million annually to remove hundreds of thousands of lake trout from Yellowstone Lake. Boats position gill nets on the lake bottom and then haul entangled fish aboard, where the lake trout are killed and cutthroats released. The most effective time to cull the largest and most voracious lake trout is during spawning, when the fish group in relatively shallow water near the shore, according to Bigelow. Currently, park managers locate the spawning areas using small transmitters surgically implanted into about 200 large lake trout. The transmitters emit distinct sound frequencies that park staff detect with boat-mounted acoustic sensors as they circle the lake. But because the lake is large and the boats must go slowly to operate the sensors, it can take days to survey the lake and locate the spawning fish and then relay the information to the gill netting boats, Bigelow said. "Two big plusses of using he lidar tool are that we could fly the whole lake in a couple hours and that we could detect any fish in shallow water, not just the ones that have transmitters," which could save time and money, Bigelow said. Shaw said he was excited to see the project come to fruition after more than a decade of research and development. Prior to joining the faculty in MSU's Department of Electrical and Computer Engineering in 2001, he collaborated with National Oceanic and Atmospheric Administration physicist and co-author Jim Churnside on the use of lidar for detecting ocean fish. When Shaw presented the research shortly after arriving at MSU, someone mentioned that it might also be applied to lake trout in Yellowstone, he recalled. In 2004, Shaw borrowed NOAA's fish-detecting lidar device — which was so large that it had to be flown in a multi-propeller plane — and conducted a trial run over Yellowstone Lake. The results were promising enough that park managers decided to send gill netting boats to a remote part of the lake where they otherwise seldom operated, according to Bigelow. The boats captured many lake trout in a short time, she said. Contracting the large plane was expensive, however. So Shaw began to design a much smaller version of the lidar device that would be more affordable and more appropriate for flying over the lake. "The goal was to build something that would fit in a single-engine Cessna," he said. Shaw's team, which included then-MSU doctoral student and co-author Michael Roddewig, succeeded in doing that by using an efficient laser produced by local photonics company Quantel. 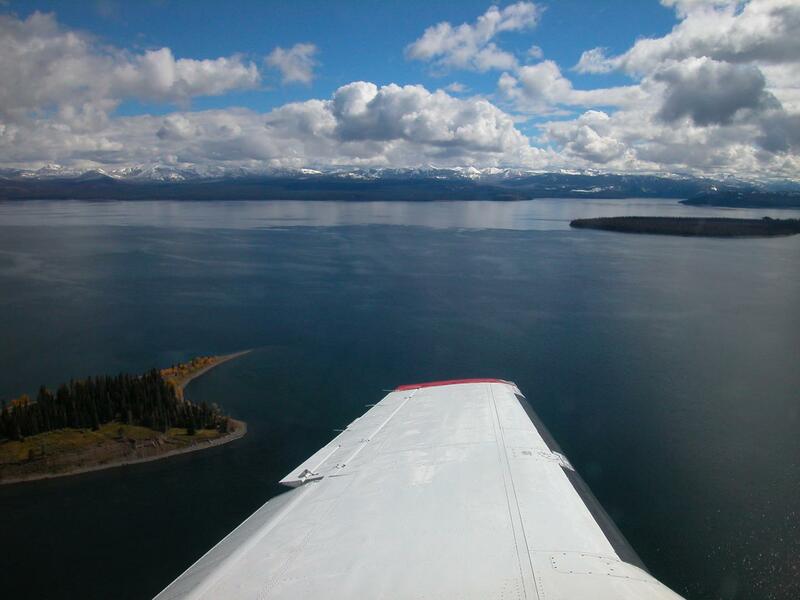 During flights in a small aircraft over Yellowstone Lake in 2015 and 2016, the team demonstrated that the new device could effectively locate groups of spawning lake trout. The publishing of the results, Shaw noted, coincided almost to the day with the invention of the laser 58 years ago. Shaw said the tool could continue to be improved and incorporated into Yellowstone's operations. For instance, producing maps of the spawning locations currently requires sophisticated data processing, but a more user-friendly interface could be developed. The tool could also be adapted for other uses, including studying layers of plankton or sediments suspended in lakes or even rivers, he said. "I'm delighted that we can do something useful for the Yellowstone ecosystem, because it's a special place," Shaw said.